Captain America: The First Avenger tonight. Really enjoyed it. I’m starting to think that (after X-Men First Class and The Watchmen) I prefer my super hero movies with period settings rather than modern day. Hugo Weaving on top bad guy form. Richard Armatage’s appearance fun if somewhat truncated. Tommy Lee Jones, Stanley Tucci, Hayley Atwell, Toby Jones, Neal McDonough, Dominic Cooper, Sebastian Stan and the rest of the supporting cast all gave excellent supporting performances. Of course it all lives or dies by the central, name on the poster, performance of Chris Evans as Captain America / Steve Rogers. Fortunately he pulled off the lanky teenager and chisel jawed hero equally well. Plot wise it’s a bit formulaic. As with a lot of super hero films it shows us Captain America before powers, gives us the back story on getting the powers and then moves to the using the powers. Along the way some of the inevitable tropes get played out – he loses people close to him, he messes up getting the girl and he has a standoff with the villain. The costumes, sets, graphics and most of the design have a really strong 1940s feels to them. I did find some of the design of Hydra’s vehicles and equipment a little jarring. Some through its size and some because it had an aesthetic that felt more post 1960 than World War II. One aspect I really enjoyed was the way the sound track built through the film. Early on, before Captain America became a super hero, it had a strong Saving Private Ryan / Band of Brothers vibe that was very John Williams / Michael Kamen. When Steve Rogers truely takes on the persona of Captain America the score moved from the traditional straight war movie theme towards something more in tune with a men on a mission film like Where Eagles Dare / The Dirty Dozen riff – still with a heavier military feel but bigger brassier and with more percussion. One thing I did find interesting was the number of people who sat through the credits to see the teaser for The Avengers. I’d say almost half of a pretty full cinema waited right to the end for the brief glimpse of the next part of the series. 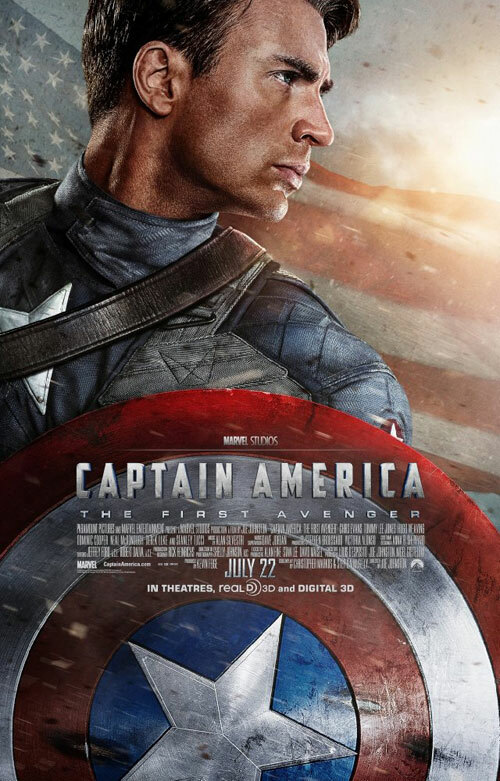 So overall I thought Captain America: The First Avenger an enjoyable, by the book, popcorn, superhero movie. Enjoyed the movie, the romance, action, and Rogers' earnest personality! Evans was HOTTTTT, cant wait for the sequel. I wish they make a sequel just for this film, and not for all the marvel heroes.